Yes, the rhymes were often rudimentary or obvious (and many of the best were actually written by Big Daddy Kane), but his infectious optimism and winning flair (plus the masterful production of Marley Marl) carried Biz Markie far beyond the status of a novelty act. His first single, "Make the Music With Your Mouth, Biz," introduced him as a human beatbox, but he went on from there to drop a jingle friendly, yet legally challenged song ("Nobody Beats the Biz"), a tribute to his favourite haunts around Brooklyn ("Albee Square Mall"), and a track with some wry cynicism about the price of fame ("Vapors"). The rangy Marley Marl cued up some classic backing tracks for these songs, with any hint of braggadocio counteracted by his carnival-esque production sense. 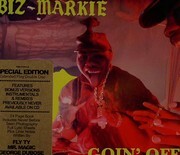 Cold Chillin makes "Goin Off" available for the first time as a double disc set, including the original album, and a plethora of substantial bonus material, from artwork to audio. With all the songs being digitally re-mastered, this project has been thought out, done right and handled with care. Don't miss it. 03. "Biz Is Goin' Off"
04. "Return Of The Biz Dance"
06. "Make The Music With Your Mouth Biz"
08. "Nobody Beats The Biz"
09. "This Is Something For The Radio"
10. "Coll V's Tribute To Scratching"
11. "Biz Is Goin' Off"